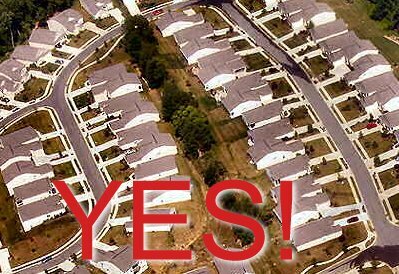 I hate to be that guy, but it saddens me that the image used for that “YES” picture could just as easily been taken of Northfield’s newest developments as it could of Apple Valley’s. I feel we really do tend to forget that there is a whole other world out there: north of second street and south of seventh. And that world is looking awfully similar to Apple Valley. Sean – yup, that’s what a little drive-by observation shows Northfield to be — oogling or googling, we can’t help but see the Hwy. 3 “Apple Valley” commercial strip, and the boring and oh-so-pricey subdivisions that have sprung up since the late 90’s. Measuring acreage, Northfield is now more “Apple Valley” than “Northfield.” That’s what the Target fight was all about, preservation of the character of Northfield, prevention (maybe just delay?) of becoming “Apple Valley South.” Someone recently pointed out the new Target in Edina, saying it was “the Target that Northfield wanted.” Edina got that new Target through land-use planning — and Northfield got its Target through land-use planning of another sort — adopting the ordinance WRITTEN BY TARGET! 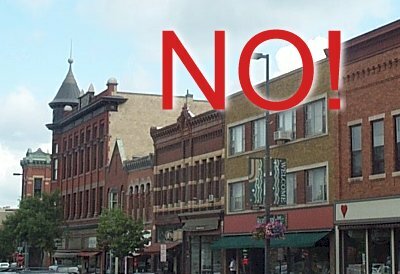 Yes, I mean to shout that out, because that fact, that Target wrote the ordinance, is an example of why Northfield lost too much of it’s character in expansion. Northfield rolled to the corporate wishes, which is not the public interest. Traffic studies and design requirements be damned, give ’em what they want! Look what we got! Growth is inevitable, no growth = stagnation and death. But growth doesn’t have to be malignant. I don’t subscribe to Money magazine. Could you give me the nickel summary of the criteria? Middleton, WI is tops, but I wonder if they considered the big honkin’ ATC transmission lines that will be coming through. Well, after listening to several commercials, I still didn’t find the rating matrix. However, they mentioned economic opportunity, good schools, safe streets, things to do, plenty of greenspace and a sense of community. Several college/university towns in that list. In fact, some of my contacts in New Hampshire have compared Northfield to the number three on the list, Hanover. I would remind everyone that the Target store came into existence by a democratic vote of the people. The Planning Commission had the opportunity to write the Target zoning laws but they refused 2 directives of the City Council to do so. As a consequence, citizens drafted the referendum ordinance. It might be worthwhile to get a matrix of the criteria. It might also be worthwhile to consider developing our own objective criteria to judge us against other communities. Well, yes, but that doesn’t mean we as a people might the right decision. People complain about our democratically elected president, after all. David — as I recall, the Petition for the Referendum was filed by citizens, as were the signatures on it, but the ordinance language used (distinct from the Petition for Referendum) was drafted and presented by Target to the city prior to the Petition. The Petition referenced Target’s draft ordinance, but did not attach it to the Petitions, and Target’s draft ordinance was not the actual language that was voted on, only a short description! Corporations draft legislation and ordinances all the time, but it’s important that people know where the language comes from. The point was that Carol’s comments were not entirely accurate. Further, if Apple Valley is kicking Northfield’s b—, then we should quantify and qualify why Money missed the point. I certainly think that Northfield looks nicer. But, there are many other qualities that make for good community. Maybe Apple Valley is a nicer community. Let’s see what makes Money think so. Then we can decide if we want to be more like them. Let’s remember that the “referendum”referred to above (on Target) was not a referendum at all but an intiative……….and it was a citizen written initiative, initiated by a petition from a citizen group seeking a specific outcome on an issue to be offered to the entire populace for vote. (Maybe the citizen group just didn’t want their candy treats, left on their chairs in the council chambers, by the big-T exec, or their red T-shirts, to go away) But , I digress. They did not understand it would change the retail nature of this community for the forseeable future…as it has done…(ask Lee Lansing) … and as it had done in communities all over this nation. As sad as it is, the preponderance of the vote in Northfield was : Yeah we don’t mind becoming Apple Valley. Let’s also remember that it was a painful time in Northfield’s social history; a time when 5 of 7 of the Planning Commissioners left over the issue. And the chair of the Planning Commisssion at that time, Margit Johnson, a person not known for erratic behavior, read her resignation speech to the city council, sounding not unlike Patrick Henry. And finally, that the Northfield/Target issue was considered to be the test case for the country by the National Trust for Historic Preservation in Washington D.C., and that their lawyers spent untold hours and energy following it all the way to the MN Supreme Court. So, I guess in the end, it comes down to a big group of citizens, showing up in a small town armory, and hammering out the values they want to see in their community. I was at the Armory meeting. What I saw was not a big group of citizens hammering out what was best for their community. What I saw was a small percentage of citizens trying to get what they wanted for themselves in their community. Unless we can identify those qualities which make for a good community, we will never be able to convince Money magazine that they should have looked 25 miles south. More bad news: Chaska is No. 8 and Vadnais Heights is No. 38. From the criteria it seems there was an advantage in being closer to the Twin Cities, since towns were judged in part on proximity to the highest number of museums, college campuses, nightclubs, theaters, shopping, etc. Housing prices, employment opportuninities, and recreation choices also played a role. OK, on the other point here, I don’t get the Target as anti-Christ argument (and I don’t need it explained again, PLEASE. I just don’t see the logic to it). It’s just one piece of an overall economic profile of a community. Is there any objective criteria, any data collected since the opening, that shows the town is better or worse in any way for having it? I’d be interested in that. Right now it just seems like a fight about whether pizza is ‘better’ with or without pepperoni, or whether Methodists or Lutherans are closer to God. Again, it comes down to those pesky facts. It would seem that without the Target/Cub center here the project would have gone to Faribault or I-35 or Farmington. Traffic to and through Northfield would be far lower, making a reportedly tough economic climate tougher. It would seem that a Target would not fit downtown, nor would the Allina Clinic or the new hospital or the high school. If a giant high school and middle school are ok, why is a big store bad? So many questions, so few facts. (And while I don’t have any facts, I have a feeling pepperoni is being used way too much in this town. And the Methodist/Lutheran thing was a trick question. Everyone knows Catholics are closest to God (JOKE). A town can make itself popular by selling its soul to the sort of urban group-think that creates the cookier cutter suburbs we see to the north, but sometimes one has to ask if being popular is worth the price. In Dundas we are fighting to stay a small community with rural values (land, river, air) so that we don’t become just another suburb feeding off the metrosprawl coming our way. 1. Actually, I was not suggesting “Target as anti-Christ”; I was suggesting that bad/no planning might accept that role. 2. I was clarifying that we did not have a”referendum” on the highway zoning issue; it was an initiative election. 3. Additionally, that initiative vote was NOT on Target, but on whether the community favored changing the highway zoning; that change resulting in a differently formed community (more suburban, if you will). And generally, I find it bizarre when there is a plea for arguments not to be made, and then the writer pursues the same argument, from their POV. Either comments stand on their own, opposing POVs are expressed, arguments rage on, or no one is interested………isn’t that it, Griff? I love ya, Bruce, but this is the kind of talk that really doesn’t help folks like me, who are trying to avoid the ‘us vs. them’ tone of superiority that just seems a slam. We are supposed to be modeling civility on this site (and I admit I don’t always succeed myself, so let’s get that out of the way). I like Dundas, like what you’re trying to do, and I’m happy to hear all about it. But you can do it without saying Apple Valley is a horrible place. I know for a fact that lots of people in Woodbury and Stillwater and Chaska and Apple Valley are working very hard to manage the high growth that they have had to absorb. I know that many developers have worked very hard to come up with projects that blend recreation and nature into residential and commercial components. Simply lumping all their efforts together as sprawl is disrepectful. Nice people make different choices for many reasons. Many people can’t afford to live here. Many can’t find jobs here. If they live to the north to be closer to jobs you slam them for choosing the evil metro. If they want to move to new homes here you slam them for causing sprawl. If people don’t move here, people weep about the bad housing market. Many just don’t find Northfield the right fit for them. It’s a choice. The fact is that there are a lot of people in the metro area and they have to live somewhere. Really, I’m sure some could hammer you for wasting gas by living here and commuting along those damned highway development corridors to Rochester. Why don’t you live in an old downtown Rochester and walk to work — or find a job in Dundas? I’m being facetious, but we all make the best choices we can, based on a lot of imperfect options. I’m all for discussion and debate. So tell me how you might have made different choices 20 years ago in Apple Valley. That would be interesting. I think your characterization of the Public Meeting as “small percentage of citizens trying to get what they wanted for themselves” is inaccurate. Compared to other cities conducting the process, we had an unusually large percentage of our citizens participating, trouncing the previous champion, Amherst, Massachusetts. Like it or not, in a democracy, those that show up get to vote. Although your Scottish Hero, Adam Smith, would praise individuals acting in their own self-interest, that is not what I heard at the event. Rather, the participants seemed to be expressing their value of safe streets, things to do, plenty of greenspace, economic opportunity, and a sense of community, the same things that Money magazine says make a great town. Good point, Kiffi. I apologize for attempting humor and slipping into sarcasm. Just frustrated and wishing for a conversation. I deal with these issues all the time, and they are so challenging and interesting, it would just be so nice to find a better way of talking about them. I liked that brief conversation we had over the weekend where you talked about your daughter, I think it was, and her views about Northfield simply not having the number of people needed to make the Ole Store or other independent restaurants viable. Please clarify if I didn’t hear that correctly. That’s a problem even metro neighborhoods have. I just did a story on Uptown, of all places, dealing with empty stores and trying to improve traffic and find a way to help local retail businesses survive. I really do pose questions because I’m interested in hearing people’s opinions. How do we build big shiny schools with all the latest theaters and gyms and sports facilities and expect kids to grow up appreciating small stores and old houses and sandlot baseball and bare bones community theaters? Do we even have sand lots any more? These are tough questions, without easy answers, but with lots of room for conversation. I’d love to hear what would have looked different today if the zoning process had gone another way when Target was proposed. Ross – thanks for your unaddled memory and your clear statement of the nature of citizen participation! Anne – Whyever shouldn’t we say “Apple Valley is a horrible place” if we believe “Apple Valley is a horrible place?” Some of my best friends live in Apple Valley (joke, but true) and clients too, and I get lost in those horrible tacky townhouse clusters where they’re all the same — I wonder how the chemically-addled heroin users of Apple Valley make it home! Kiffi – Though you didn’t, and won’t, I’ll suggest Target is the anti-christ, representing corporate interests that roll over local government and community leaving hate and discontent in their tsunami wake. And yes, it was an “initiative” yup, that’s right! Bruce – To call developments to the north of Northfield “cookie cutter suburbs” as if the developments to the south (Dundas) are not, ahem… what’s the difference — both are “Apple Valley” personified. Anne – As to Target in town, it would have been a lovely addition at the NE corner of Hwy. 3 and 2nd St., rather than the vacant condos now there. Put it on stilts above parking, and it would work just fine! And maybe that would have been enough to get that ugly substation off the NW corner. There was an in town Target proposed in Red Wing, just three blocks down my bluff, but for that Target, they wanted to mow down an historic building, and there was a lot of uproar and so it didn’t go forward, and RW ended up with a solitary building at Tyler Rd. We could have pushed for some innovation, there’s a great one in CA, and even one in downtown Mpls. They’re willing to design if that’s what it takes to build, but they won’t do it voluntarily. Y’all – I’m trying to remember the guy’s name who was the Target rep, the one with the M&Ms, but anyway, somewhere in my Target boxes I’ve got the documentation (cover leter?) that he provided that ordinance language, the big long multi-page one that wasn’t really voted on. I found “What if…” in a discount bin, that tome of historians doing Anne’s suggestion about major turning points in history. We perhaps should do that exercise in our daily musings, or draw up the street scenes. Another big “what if” for me is “What if Northfield had bought into and built the garbage incinerator?” Recently, Bob Jacobsen told me that a garbage burner was proposed decades ago, the ardent promoters using Red Wing as an example (we have TWO! ), and he filled me in on details of that fight and Northfield’s demonstration of good sense. That’s one example of a good civic decision, the “what if” question. Apple Valley traded its aggregate pits for schlocky clustering housing. What have Northfield’s trade-offs been? Pressed for time here, but briefly ,Anne, what would have looked different is that no major development would have been allowed to “leapfrog” down the highway; rather , it would have had to expand from the downtown, south and north. Another interesting point, in the Comp plan of that time, what is now the Target/Cub site had been identified by plann commisssion, etc., as “Site A” and earmarked for hight tech business development……… see the irony? 36 acres of land specifically earmarked for the kind of Biz NF now seeks to attract, and doesn’t have the land to support. Just because the developer provided the ordinance doesn’t mean the company wrote it. Often a company like Target will have gone through the same process in dozens of communities and there are ordinances approved in one community that address the concerns facing another. For example, St. Croix Falls is facing big development and has no background in it. Officials are gathering zoning information from other communities, and some developers are helping provide the documentation of processes in similar communities. Hard to believe, I know, but there are other communities like Northfield. And hard to believe, but a lot of developers are decent people. You can hate Target and Apple Valley, I’m just saying that those statements don’t encourage thoughtful discussion. On the other hand, I find your comment about the viability of a Target downtown interesting, even though I don’t agree with it. Where would the Cub be in this scenario? Well said. It is time to move forward. As we move forward, we would do well to remember that the Target vote is a much broader expression of the public will then a town meeting having less than 2% of the citizens. The town meeting was not advertised as, nor intended to be, a referendum on the town’s future. It was advertised as one part of the input needed by the consultants to make an expert recommendation on a Comprehensive Plan. But, getting back to the question of the blog – Can we quantify why Northfield is a better town than Apple Valley? Or, from Rob Hardy’s perspective – Without worrying about Appley Valley, how can we quantify what would make Northfield better? What was troubling to me about the town meeting results was that 55% of the people thought that the most important value was to keep Northfield looking nice. Until we are able to state values with more substance, we will not be able to achieve sustainability. Even the picture and comment above suggest that if Money could “see” Northfield that it would change its mind. How much do pretty and historic buildings add to the quality of life? May I suggest that we at least scrutinize the numbers and criteria used by Money magazine to see if the numbers are telling a story that we don’t see? Perhaps we are overly concerned about Northfield’s appearance without focusing enough upon lasting values. As a former Lakeville (not Apple Valley) resident who recently moved to Northfield, I’d like to observe that despite the process that led to Target, Cub and other suburban-style commercial in Northfield, the downtown appears to have survived the competition very nicely. As a business reporter for the Star Tribune, I wrote about the Target controversy when the store opened a few years back and quoted some of you on the fears that downtown would die. Jacobsen’s is gone, to be sure, but many new businesses have opened since then. In fact, I stop by the Hideaway in the old Jacobsen’s building virtually every day for a coffee, lunch or dessert. It’s fascinating to me that the owners of that coffee shop opened a downtown store after opening first on Hwy. 3. Apple Valley, by the way, is trying to build a downtown in the shadow of the boxes. It will never be what downtown Northfield is and, I believe, will continue to be. Anne – Yes, Northfield is not unique and there’s no need to reinvent the wheel. And thanks to Ed Emerson, I know a fair amount about things in St. Croix Falls and their zoning issues. Nearby in MN, I worked on Chisago County’s transmission ordinance, and am now representing the City of Lindstrom on the Chisago transmission line. Land-use situations are not unique, but when ordinance language is proposed, such as the ones my clients are proposing for Waseca regarding tanks and gun ranges, it’s instructive to know the origin. A corporation offering specific, detailed, and lengthy language for land use change is very different in intent and interest from language developed by a Planning Commission and City Attorney (even where substantive language might be similar). Language is always written and offered by lobbyists, that’s how the process works, and it’s a large part of what I do! But, when looking at language, we must be clear of its origin, and recognize that when it’s presented by lobbyists, that they’re putting forth what THEY want. They’re not representing the city’s interests, or the residents’ interests (there is a distinction). When Ed Emerson, the City Administrator of St. Croix Falls, openly gathers examples from others searching for options, that’s very different from Target’s promotion of language that gave them what they wanted (it was Target, not the developer, that was lobbying). In my experience, developers have been parasitical in their practices, looking for subsidies (TIF, JOBZ), taking them, and sometimes even disappearing, leaving communities holding the bag. As you know, this happens all to often on the Range, and even happens in Northfield! Interesting point about leapfrogging, but on the other hand, one could argue that Target/Cub/Menards/KMart created a southern bookend to downtown, drawing traffic from Faribault and points south and encouraging development between, which has happened. And it has kept reatil on the only traffic corridor able to handle it. A downtown Target would have created congestion but not spillover downtown business. Better access roads with landscaped boulevards would have softened the look along Hwy. 3 nicely. In fact, landscaping should be a much bigger part of development requirements here, IMHO. As for high-tech, using a retail corridor for industry/office seems odd. It isolates workers, forcing them to bring lunch and stay on campus, then just go home. That would seem to be the development you’d want at Second and Hwy 3, because workers will shop/eat/drink downtown, while Target customers will come and go without walking across the bridge. Parking would be available at night for restaurants and theater, etc. And not all lawyers are sharks…Let’s stipulate that you’ve met more than your share of bad developers. And I know there’s a difference between company written ordinances and community-written ones, but I’ve seen some dumb community ordinances as well. With the Internet, it takes officials only a few clicks to compare notes on the evil proposals, so I’m tired of the victim thing. The Range is filled with local people who have proposed or bought into most of these deals and are only to happy to play victim when they don’t pan out. So are other parts of the country, so I’m not just picking on the Range. The elected officials abandoned their responsibility in desperation when the mines closed. The reality is that most of that population went there for a reason an that reason is gone. They should have moved away, leaving the natural areas to heal and concentrating the population and services where it was cost efficient and reasonable and sustainable. Spending millions to build industrial parks and city halls and highways to serve isolated towns with 150 people is neither environmentally friendly nor economically feasible. This has been great fun, a real conversation. Thanks. But I have to get to work. Just catching up on this conversation. It surely brings up some bad memories. Tom Bonneville of Dayton Hudson chose a cornfield in Bridgewater Township for the Target project (surrounded by 200 acres ripe for future development), and the City offered it to him on a platter. There was available land on the fringe for a 90,000 sq ft Target store, as originally proposed, but neither City Hall nor the newspaper was taking note of it. Those wanting the project chose to blame the Planning Commission for dragging things out, which was NOT the case. There were process violations all along the way. Several members of the Northfield Planning Commission resigned in the course of it. They were principled people. Bonneville was very open in telling me that the Target complex aimed to provide merchandise and services so people wouldn’t have to go downtown. Now that Menard’s, CUB Foods, restaurants, banks and other businesses are filling in, his dream seems to be coming true. Add to that, the sprawling residential complexes–Apple Valley here we come. One could argue endlessly, providing cases/statistics to support a particular POV (whether a DT Target would have worked or not) but the important facts in my mnd are; 1. The form of the town was changed 2. The Comp Plan was violated; i.e. the development zoning as re-written was not allowed by the current comp plan, and that was for a period of some months, and that is a violation of state law. A community/city council may make no law that violates its own comprehensive plan. And there’s more and more; just don’t feel like rehashing it all. But Carol is correct re: the T influence on the zoning ordinance. I also, somewhere buried in the files for a book that was not written, have a copy of the zoning ordinance, scribbled all over with comments like “we cannot accept” and even more offensive. It should never have been allowed to happen; there is no obvious way to de-construct it. To me, referring to the Target/Cub area as the “southern bookend” to the town is agreeing to be the most ubiquitous of all ubiquitous-ness. How can a community that insists it wants to be an “independant small town” , not a suburb, ever agree to that commonality? But having a beautifully designed 36 acre high-tech Biz park within two miles, walking/biking of your town center (Bridge Square) says something about the community you want to be; That’s a “gateway” to be proud of. Please excuse messy typing in my post above ; not sure how that happened, and not even a glass of wine! With Tracy’s “tricked up” photos this thread should never have been started. And when Stephanie and Kiffi start pouring over their hand written notes taken at Council, Board and Commission meetings held over seven years ago THIS THREAD IS OVER! Kiffi — Thank you for the many many hours you’ve spent at City Council and Planning Commission meetings, and your great memory and recordkeeping. Keeping records and referring to them in these discussions keeps it honest, the Council, the Planning Commission, and this blog. Yeah, Larry, lighten up! you had a POV then..you wore the shirt, and ate the candy, as it was your acknowleged right to do……..
35 posts and not one person has even attempted to quantify why Money rated Apple Valley higher. How about some speculation as to why Money is wrong (or right)? As long as we have some who want to continually look backward, instead of the many who are trying to look forward, led by the Northfield Area Chamber of Commerce, why don’t we add a new tourism event in Northfield. We could call it the Defeat of Target-Not – DOT-Not. We could recreate all the heated meetings in City Council Chambers with lots of local characters involved. Since the Metro media is so focused on Northfield for other reasons this would be a chance to capitalize on our finest days since the James Gang road into town. On the other hand, I vote for getting all our citizens focused on looking forward to create the town we all want. So much for the End of the Thread. Hey, I believe I mentioned some of the criteria that worked against Northfield. It’s just further from the vast resources of the Twin Cities (museums, stores, zoos, colleges, ets. You can argue whether 30 minutes more is a hardship, or that retirees might not value 30 college campuses, but that’s the critera. The other key factors include a median family income of $90,000 in AV and $53,000 here, with a median home value of $250,000 in AV and about $192,000 here. That’s good if you own, bad if you’re buying. There are some subtle things. The Rice County median age is 23 and AV’s is 35, which could indicate we have a lot of kids and starting workers, while AV has more at the higher income management/skill level. Just a guess. The reports also counts commuting time, but I didn’t find any numbers for Northfield (I know how long the commute is to the TC, but now what percentage of workers are making it). Northfield also falls below AV in cultural diversity. Yes it does make sense to learn from the past but look forward. I do think, based on the interviews I have done in the last few months in several cities doing downtown redevelopment or revival, that getting offices and workers downtown is a huge factor in the health of a downtown business district. I’d be happy to share contacts and information on this topic. Getting more retail downtown is good, getting more customers there is even better. Clearly Money is about wealth, growth and success, and so the criteria might not fit Northfield. Perhaps better information could be gleaned from books and ratings about small towns. There’s a book ‘The New Rating Guide to Life in America’s Small Cities’ and others that have lots of criteria that might be more relevant to Northfield. Ross (#7)and Anne (#13) made references to Money’s values, but they seem opposed. Bruce (#15) made references to Dundas values, but they were difficult to quantify. Anne, I am ready to tackle a “reference” book that could give us some idea on how to rate ourselves. Rob (#14) has a good suggestion that we should make Northfield better (although he didn’t define “better”). Maybe we could even do a “back at you” piece to Money once we have our ratings put together. Part of the reason I made this post in the first place is to illustrate the way that numbers and statistics, helpful as they are, can miss crucial elements. For example, in a town whose population consists of more than 25% college students, isn’t it obvious that that fact will skew both averages and medians, whether you’re talking about age or income? Numbers simply don’t tell the whole story, so making a whole story out of numbers is almost meaningless. Or, as Mark Twain (or someone equally quotable) once said, “Figures don’t lie, but liars figure”. For example, in a town whose population consists of more than 25% college students, isn’t it obvious that that fact will skew both averages and medians, whether you’re talking about age or income? Numbers simply don’t tell the whole story, so making a whole story out of numbers is almost meaningless. Well and regardless, is my quality of life better as a town citizen because the house next door pulls in $90,000 instead of $53,000? I mean as long as the town isn’t in utter poverty, I don’t see how it makes a difference. Less money to waste on junk at Target. Mr. Mathern of Mendota Homes says the reason he is having trouble getting a restaurant to locate in his Northfield Crossings complex is that all the major restaurant operations use a typical population number of 50,000 people living within a 10 mile radius of the restaurant location. Northfield has only 25,000. Therefore, the location is well outside the norm where it would be a “slam dunk” to locate here. A lot of other, extenuating circumstances would have to be present in order to attract a Chipotle or a Panera Bread to this low population. What do we have as “extenuating” factors? We can’t even get an Ole Store to reopen. Anne Bretts has it correct – we need customers and consumers. Why don’t we let the Chamber of Commerce do it’s function with all of our full support? Larry, I’m not clear on what you’re suggesting. Is the goal to double our population so we can attract a few chain restaurants and their low-wage jobs? I’m not being facetious, I’d really like to understand your line of reasoning. What exactly do you think the Chamber can do? Mr. Mathern is right, according to the brokers and leasing agents and developers who deal with the chains trying to fill places in St. Louis Park and downtown Mpls. and Mankato and everywhere else. I mentioned that back when Griff was wishing for an Olive Garden earlier this spring. proximity to a hospital, major employer (thousands), shopping center, theater. Seaonal draws such as ValleyFair or the zoo or a boat dock don’t do it. Employers want the same thing. They don’t want a few good men, but a steady supply of qualified people within a reasonable commuting distance. Getting a lot of smaller businesses might work but there’s risk of them failing and a certainty that they will need time to grow. Many major colleges are boycotting the big “Best Colleges” ratings for the same reasons, basically that colleges and universities are too varied to compare in a meaningful way. There are analysts from some of the large leasing and real estate firms who could share their regional evaluation criteria. I don’t have a personal view about the perfect population or workforce or household income. And I hate to say this goes back to another discussion about numbers, but getting meaningful criteria and tracking the data matters. David, I’d be happy to help with researching which facts are relevant. I do think the small towns book has potential, though I haven’t read it. Finally, David, you mentioned that Ross and I have a different take on the Money criteria. I’m shocked (LOL). He saw the trees and safe streets, which are similar. I was looking for the things that make them different (not better or worse but different). Money has an upscale corporate metro reader base. They’d like to go to a B&B in Northfield but probably wouldn’t choose Northfield over AV. Their idea of small town life runs toward Wayzata and Excelsior. As for what would draw people to Northfield, the first thing you have to decide is who will be let in. There seems to be a strong faction that believes about half the people here should leave — but should come back to shopt and eat. seems smart to interview the employees at the major companies to see where they live and why. Are housing costs too high? Do we need more jobs or more housing, or do we just need to get a lot of affluent suburtan people to come here and shop and go home so we can make fun of them behind their backs? (JOKE) Maybe we just need a sense of humor so people will want to hang out with us. Now here’s an interesting comment; D.L., post #36, says the Retail Strategies committee says we only sell 49% of what could be sold here………..so, considering that we have a bunch of very strong/innovative retailers, and a bunch of that bunch are on the RS committee, what do they feel is not being sold here, that could be a successful/profitable business? I would really like to know their opinion on that one. And since we have lost a lot of retail in the thirteen years I’ve been in NF, How can the Chamber correct that situation, and if they could( and I don’t believe they can) why haven’t they done so? I just see it as a huge sea change in the way people shop, and I don’t see how the Chamber can totally change a societal shift, any more than the good individual retailers can. You have to be a bit careful making promises for the Chamber that they can’t , or haven’t fulfilled, and probably shouldn’t be expected to fulfill. Tracy, what he’s saying is that no restaurant, chairn or independent, can make it work on the numbers we have and the costs of that space. I’ve been asking for two years and I don’t have a clue what you and Ross and others want the city to be. A few more people? No more people? Deport some? How many more jobs? Where do the workers live? What cities are comparable and why? (Gut feelings encouraged, just to get someone to give a straight answer).These questions and answers are key to developing criteria and comparisons, setting goals for improvement and tracking them. And BTW, independent restaurants tend to pay even less than chains and have much less stable business cycles (see Ole Store, about as good as it gets and still it didn’t work.) Independent small businesses in general have fewer full-time workers, little or no money for healthcare or benefits and no cushion when the owner gets sick or pulled away from 24/7 responsibility. The charming old downtown model was built on the backs of the wives and small children and parents of shopowners, many of whom lived above the stores to save money and be available. The history of small towns is not an idyllic story of professional satisfaction, financial security or healthy lifestyles. A few people did well, and a lot of others did as well as they could. Facts, facts, facts, those pesky things just keep popping up. Regarding the Crossing’s attempt to attract a restaurant, consider Hastings and their main thoroughfare development called “Schoolhouse Square” (have I got that right? ), which has a Green Mill Pizza and a Grand Ol’ Creamery. Neither of these are national chains; the Creamery an outpost of the St. Paul Grand Ave. ice cream shop, and the Green Mill’s original shop at Grand and Hamline in St. Paul. In other words, it doesn’t have to be Appleby’s/Chillis/Red Lobester/etc. Maybe the marketing folks at the Crossing are barking up the wrong (national chain?) trees? Paul, good point. There are a few metro restaurants testing additional sites. I’ll see what I can find out. The owners of the old Ciatti’s in Burnsville have built a new Chianti Grill, with a couple of locations. They still tend to go for higher population places, but I’ll see what’s out there. The big problem is the lack of through traffic on 3. With I-35 so close, drivers are there and the growth in commercial/retail is hugging that corridor. So, if you want nightclubs and restaurants, you need more residents, workers or visitors. But I don’t know why people from AV would come here for dinner if we constantly insult them. I just wish people here could be more welcoming and civil and less arrogant when talking about neighbors — and potential customers. “We hate you but we want your money” isn’t much of a ad campaign.